Jeremy Wade McKinnon (born December 17, 1985) is an American musician and record producer, best known as a founding member and the lead vocalist of A Day to Remember. He has produced full-length albums for The Devil Wears Prada, The Ghost Inside, Neck Deep, and Wage War. 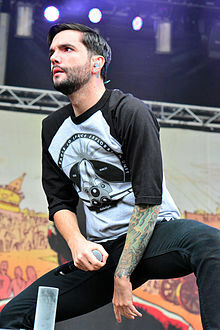 Jeremy McKinnon was born in Ocala, Florida and grew up with two sisters. His parents are originally from Brooklyn, New York and he is of Irish and Italian descent. McKinnon first got a job at Boston Market and later went on to do construction work. McKinnon's interest in music came as a result of hanging out with a friend's band. McKinnon was inspired to write and play heavy music by a local band, Seventh Star. [nb 1] McKinnon often got into trouble during high school in Ocala, Florida and as a result he would write music. McKinnon's first band was the ska band All for Nothing, before joining guitarist Tom Denney and drummer Bobby Scruggs to form A Day to Remember. He appeared in the show Pawn Stars. McKinnon and A Day to Remember bassist Joshua Woodard have formed their own record label, Running Man; in partnership with Epitaph, they signed up band Veara. During an interview in 2012, McKinnon said that the possibility of doing a solo album was unlikely. On December 25, 2016, McKinnon married his long-time girlfriend, Stephanie Morrison. On Father's Day 2017, Stephanie revealed on Instagram that the two were expecting their first child together. On December 5, 2017, McKinnon and his wife announced the arrival of their first child, a daughter - Montana Nash McKinnon. McKinnon follows a straight edge lifestyle. McKinnon cites punk rock band Millencolin as his biggest musical influence, and cites ska punk band Less Than Jake for his influences on the stage: "They were having fun during the concert, they were not super serious. But they were not so goofy so as to appear ridiculous. Simply, they created a great atmosphere, and I've always loved this. Then I saw the Flaming Lips, and Rammstein in Germany, and that was the craziest concert I've ever seen. I'm just trying to combine and put into practice all the amazing things that I've loved over the years." In Fear and Faith Your World on Fire "Strength in Numbers"
For the Fallen Dreams Relentless "Nightmares"
Pierce the Veil Selfish Machines "Caraphernelia"
Mest Not What You Expected "Radio (Something to Believe)"
August Burns Red Found in Far Away Places "Ghosts"
Neck Deep Life's Not out to Get You "Kali Ma," "Gold Steps"
The Ghost Inside Get What You Give "Dark Horse"
See also: the categories Albums produced by Jeremy McKinnon and Song recordings produced by Jeremy McKinnon. ^ The band's bassist was Drew Russ, who would later become A Day to Remember's video editor. ^ k-ron (March 26, 2009). "Behind Closed Doors: Jeremy McKinnon (A Day To Remember) on k-ron's Blog – Buzznet". Kron.buzznet.com. Archived from the original on July 13, 2012. Retrieved August 5, 2013. ^ a b c TheLiveAddiction (November 6, 2013). "A Day To Remember – Jeremy McKinnon Interview 10.20.13". YouTube. Retrieved December 7, 2013. ^ Rock Sound (February 15, 2014). "Rock Sound Hangout with a Day To Remember!" (Interview). YouTube. For high school, see 19:58. Retrieved February 16, 2014. ^ jeremymckinnon (January 7, 2011). "Twitter / jeremymckinnon: All For Nothing RT". Twitter.com. Retrieved August 5, 2013. ^ "Allschools Network – Interview A Day To Remember". allschools. June 14, 2005. Retrieved August 8, 2013. ^ Mesecher, Andy (October 9, 2011). "Q&A with A Day To Remember". Music Connection. Archived from the original on May 15, 2013. Retrieved August 16, 2013. ^ jeremymckinnon (March 11, 2010). "Twitter / jeremymckinnon: Here's the news @joshuawoodard". Twitter.com. Retrieved August 16, 2013. ^ Epting, Chris (April 16, 2012). "Noisecreep exclusive – A Day to Remember's Jeremy McKinnon". YouTube. Retrieved February 9, 2014. ^ "A Day To Remember's Jeremy McKinnon Marries Longtime Girlfriend Stephanie Morrison In Surprise Wedding!". Stage Right Secrets. December 26, 2016. Retrieved February 7, 2017. ^ "Twitter". mobile.twitter.com. Retrieved February 7, 2017. ^ HMXThrasher (April 29, 2010). "HMX Gets Toursick: An Interview with A Day To Remember // Blog // Rock Band®". Rockband.com. Archived from the original on October 20, 2013. Retrieved February 8, 2014. ^ "A Day To Remember's Jeremy McKinnon talks Warped Tour, going mainstream and ambitious stage shows | Tampa Bay Times and tbt*". Tampabay.com. July 27, 2011. Retrieved February 8, 2014. ^ "WebVoyage". loc.gov. Retrieved October 23, 2015. In the Search for box enter How to Score in High School, select Title then click Begin Search. ^ runningfree1 (December 26, 2009). "For the Fallen Dreams – Relentless – Album Review". AbsolutePunk.net. Retrieved July 21, 2013. ^ Emily (June 24, 2011). "Pierce The Veil Interview –Blunt Magazine". Bluntmag.com.au. Retrieved July 7, 2013. ^ "Mest Release Song Featuring Jeremy McKinnon". AMH Network. June 4, 2013. Archived from the original on July 7, 2013. Retrieved July 7, 2013. ^ "What We Left Behind – Veara | Credits". AllMusic. Retrieved August 16, 2013. ^ "Dead Throne – The Devil Wears Prada | Credits". AllMusic. Retrieved August 16, 2013. ^ "THE GHOST INSIDE: New Album Details Revealed". Blabbermouth.Net. April 26, 2012. Retrieved July 9, 2013. "The Downfall of Us All"
"All Signs Point to Lauderdale"
"Right Back at It Again"